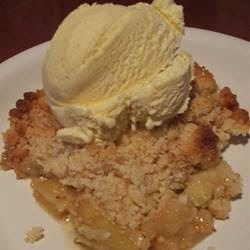 "Use this easy recipe with leftover apples from the fall or anytime in the year when you want an easy take- along dish or when company arrives at your door unexpectedly!!!! Serve warm with ice cream or whipped topping. You can substitute 2 (21 ounce) cans of apple pie filling for the apples and water."